The new Pentax K-x occupies the sweet spot between the entry-level K-m and prosumer K-7 cameras, combining the ease-of-use of the former with many of the advanced features of the latter. The 4.7 fps continuous shooting speed, speedy and accurate 11-point AF system, HD movies and an extensive ISO range of 100-12800 mean that Pentax should be onto a real winner with the new K-x. The K-x offers a veritable wealth of options that will appeal to beginners and more experienced photographers alike. The combination of Live View, small and lightweight design and hand-holding auto modes make the K-x an easy upgrade option for compact camera owners, while the extensive range of manual modes, wide ISO range, fastest shutter speed of 1/6000th, 100,000 shutter life-span and not one but two RAW formats more than cater for the experts. And whether you're shooting in JPEG or RAW mode, there are a wide range of options for getting the best out of your images, with the K-x offering the most in-camera editing options of almost any DSLR on the market. The inclusion of HD video is sure to generate a lot of interest in this mid-range DSLR, but unfortunately, as with most of the other DSLR cameras on the market that offer video recording, it's not the most user-friendly experience. There's no handy one-touch recording, a reliance on manual focusing, inability to change the aperture or shutter speed during recording, large file sizes that quickly fill your memory cards, and the inherent handling quirks of the DSLR format. On a more positive note, the K-x's image quality is excellent. The K-x creates noise-free JPEG images from ISO 100-800, only starting to become apparent at ISO 1600, with progressively more noise and colour desaturation at the highest settings of 3200, 6400 and the attention grabbing 12,800 setting. Although the top speeds don't produce very usable results, the K-x certainly holds its own against the main competition from 100-3200. Exposures were generally around 1/3rd EV stop under-exposed and colours were accurate using the Bright setting, although the default sharpening setting results in images that are a little soft. Shooting in either of the two RAW modes ultimately produced better-looking images than the JPEG mode, especially as you can use the widely-supported DNG format, although you've obviously got all the post-processing overheads that go with RAW. The HDR mode makes it easy to create images with greatly expanded dynamic range, although you don't have too much control over the final effect and you really need to use a tripod to keep the subject sharp due to the method of combining multiple exposures. The D-Range options help make the most out of both the shadows and highlights in a high-contrast scene, while the extensive range of digital filers, custom images and the multi-exposure mode are nice creative additions. 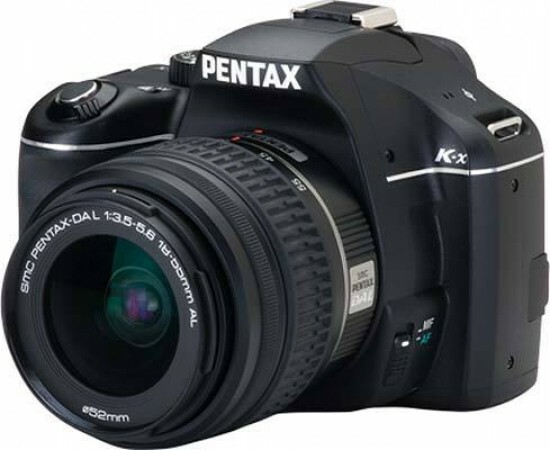 The Pentax K-x is a small, light and easy-to-use DSLR camera that punches well above its mid-range weight. The only major negative that we can think of is its diminutive size, which for many people will actually be a positive. We're certainly convinced - the Pentax K-x is our new favourite "affordable" DSLR and fully deserving of our rarely-awarded Essential / 5 Star rating.